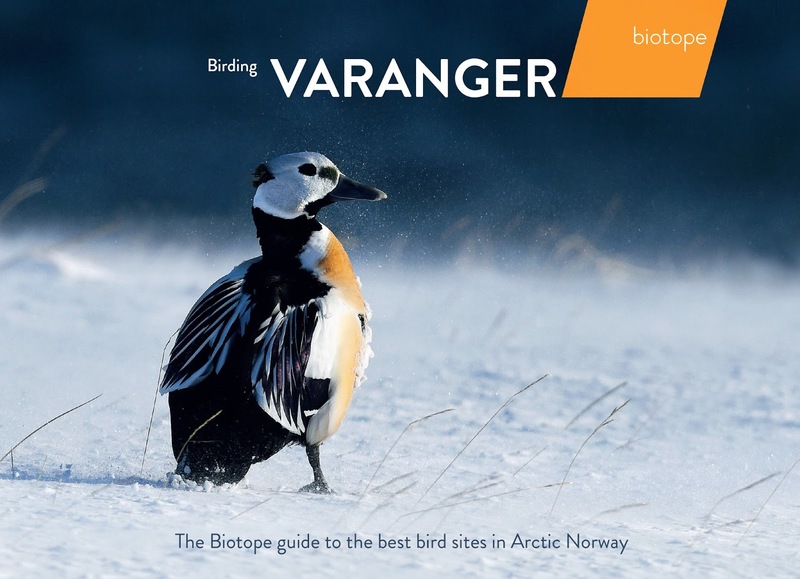 With the above words we introduce Varanger in our guide book to this amazing birding destination. 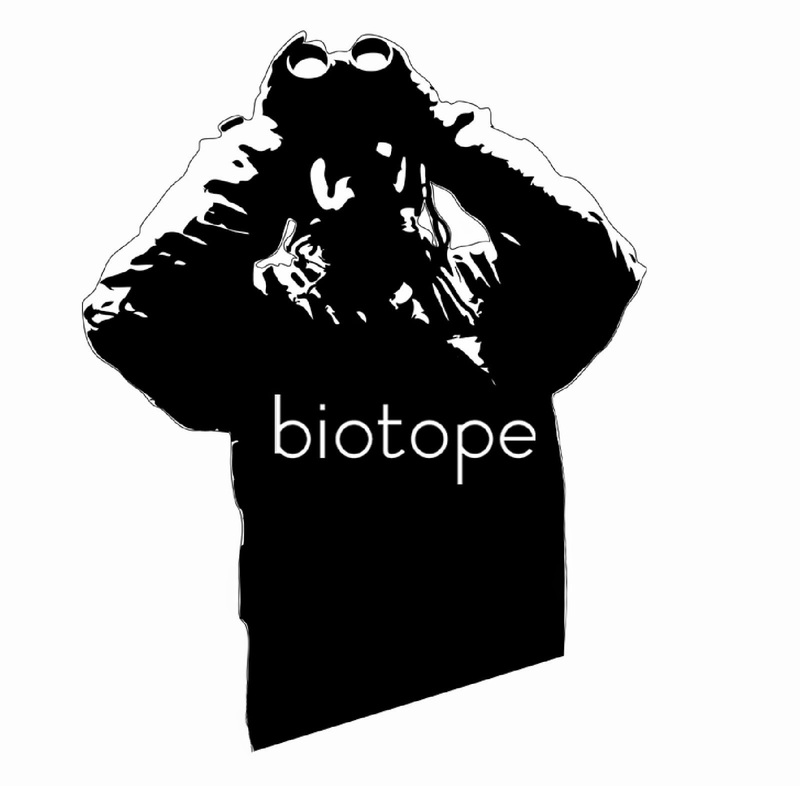 For us at Biotope this new 200 page guide book is the result of a continous work with developing Varanger as a birding destination since we moved to Varanger in 2009. 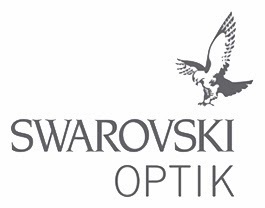 Our aim was always to make Varanger more famous within the international birding community. 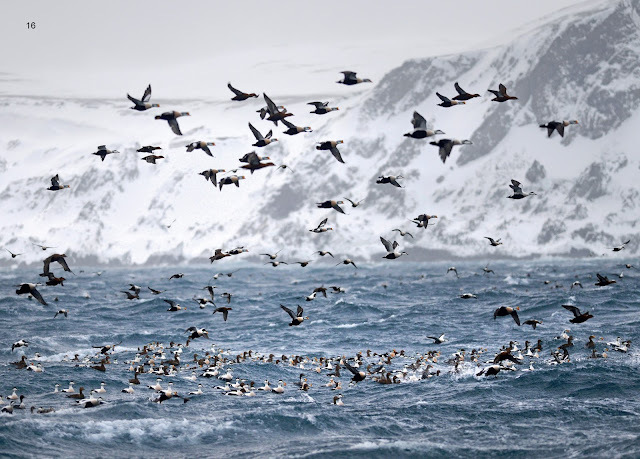 This is a community of nature enthusiasts that we have shared our Varanger journey with on social media, through blogposts, through meetings both in other world birding destinations and in Varanger. Giving Varanger a voice on this international scene has been an amazingly rewarding experience. We have lost count of the numbers of emails, tweets and facebook requersts from birders about birding in Varanger. We have tried to reply to as many as possible. The past three years we have been working on combining all our knowledge, feedback and insider information into this new birding destination guide book. And the response has been overwhelming! 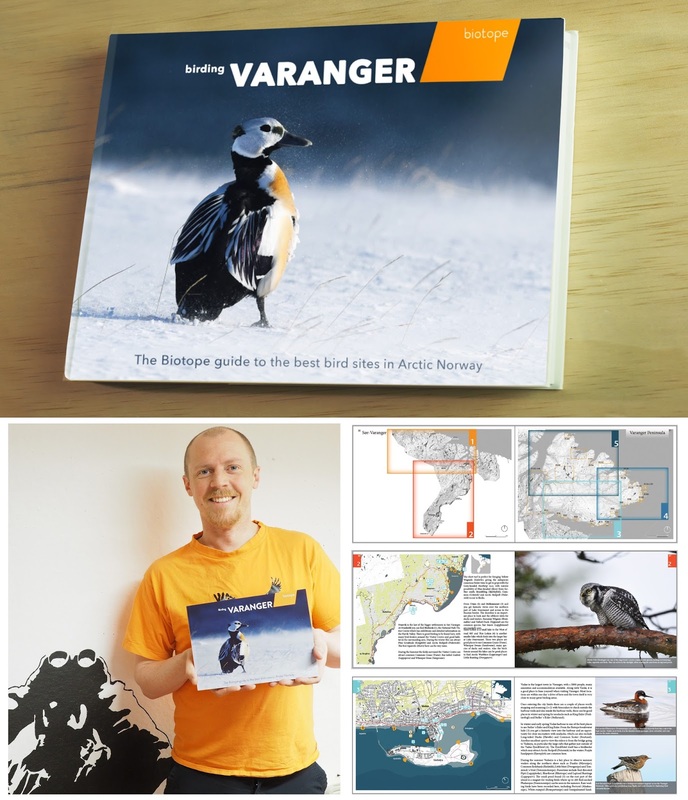 The ´Birding Varanger´ guide book - aka the Biotope guide to the best bird sites in Arctic Norway - was published in Decemper 2015. In 3 months we sold out the first edition of 1000 copies! The book was soon reprinted in another 1500 copies and the orders just keep coming in. Our book has now sold to 28 contries, from all over Europe to Australia, Japan and Brazil. We are extremely thankfull to all of you who have bought our book! The feedback we regularily get on emails, in tweets, on facebook and when meeting birders in Varanger puts a big smile on our faces. Many are labelling the guide book both inspirational and innovative. We have aimed to make this book as visual as possible. Many large maps, with detailed information are completemented by large aerial panorama photos of key sites in Varanger. Needless to say we are humbled by all the great feedback. Thanks all! Below follows a few samples from the ´Birding Varanger´ guide book. If you plan to visit Varanger, or if you are simply curious about this amazing region we are very thankful for every single book we ship from our office in Vardø to the world! Aerial over Vardø town in winter plumage. The famous Hornøya bird cliff to the upper right, only 5 minutes by boat from Vardø harbour. Large aerial panoramas of more then 30 key sites in Varanger is spread throughout the book, depicting Varanger during the seasons. In the guide book we have divided Varanger into 5 chapters, covering all the top birding sites from the taiga sites in Øvre Pasvik in the south to the harsh arctic coast of Berlevåg in the north. Each chapter starts with an overview map. This region map gives you an overview of all the detailed site maps in the chapter, covering in detail all the top sites you should visit. 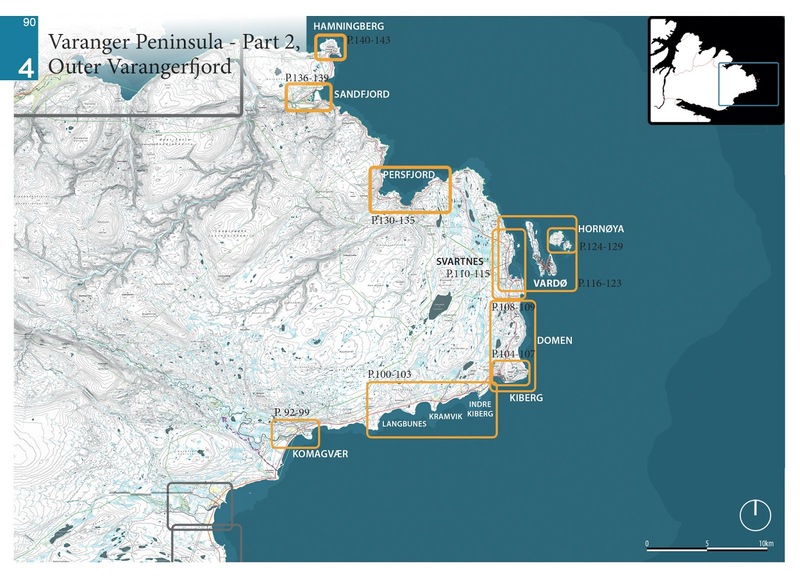 This is the overview map of the outer Varanger fjord. 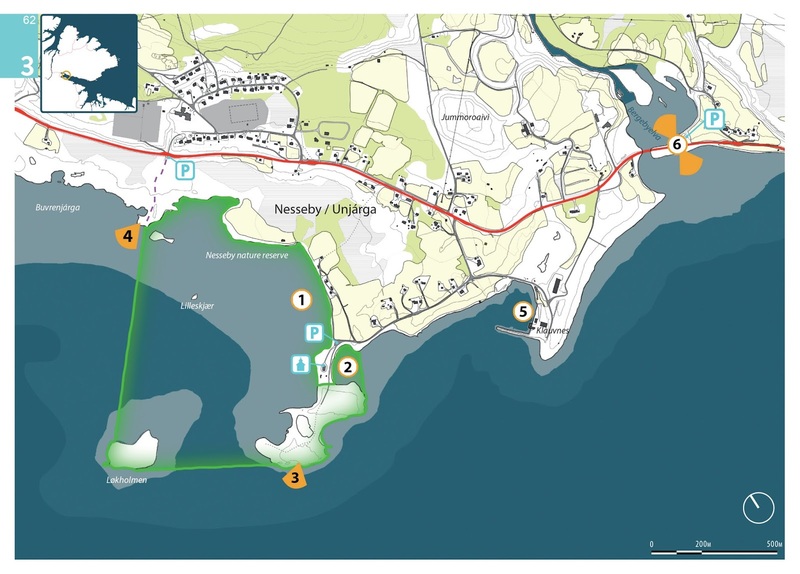 Each top site is treated with its own detailed map showing you where to park, spcific birding points to visit and key bird sites. The towns of Varanger are also covered very well as these are often also great birding sites (like the fishing harbours). In these maps you will also be guided to gas stations, restaurants, hotels, etc. This map is covering the Nesseby nature reserve. Throughout the guide book you will also find a wide array of bird photos, showing both species and bird spectacles, like the above photo of the large King- and Common eiders rafts in Vardø, Varanger. This photos also happens to be the first ever documentation of Pacific Eider in Europa (can you spot the bird? Click on any image for bigger slide show views). Aerial panorama over Gednje on the high tundra. These aerials makes it easier for you to see and explore the various habitats of each site. Map over the Gednje site, with an accompanying description of which species you can expect to find, and where to look for them. Our aim is to make your Varanger birding experience as productive and inspirational as possible!